eHarvestHubis a blockchain solution aiming to solve today’s food supply chain problems that the world is facing. Their mission is simple: to directly connect small-to-medium-sized farmers with distributors to increase profits while making food more accessible and less expensive to the consumer. The idea sounds marvelous and is already generating a buzz. Their whitepaper is well laid out, explaining how the produce supply chain can be improved and the steps they will take to achieve this. The ICO will start on April the 28th and will last until May the 24th. The maximum sale is 25 million EHH tokens, with a price per token of 30 US cents and a minimum transaction amount of 0.15 ETH. The soft cap is again $2 million and they offer bonuses lower than the pre-ICO but also dependent on when you buyout. The maximum EHH tokens for the project will be 125,999,950 with 60% going for the ICO and the rest distributed among the company, advisors, marketing and others. 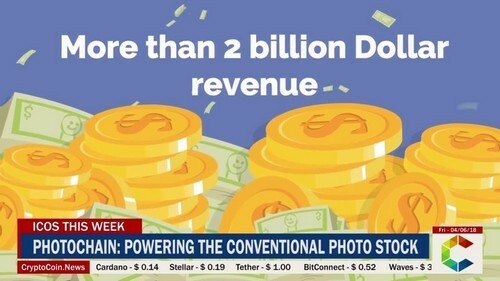 Photochainis a blockchain technology driven to reinvent conventional photo stocks. They offer a service which could benefit both the contributors and customers by lowering fees, allowing a larger margin of profit. They will offer a peer-to-peer marketplace where artists can offer their work to many potential buyers within the Ether platform. Their work will always be linked to their name and payments will be permitted in cryptocurrency. BitRewardsoffers a loyalty points and cashback program in cryptocurrency that provides rewards on blockchain to merchants and buyers. They’re looking to bring a fresh change to the e-commerce business by enabling online retailers to reward their customers with a cryptocurrency called BIT. They plan to bring stores on board by offering the platform to them for “free”, implying that they would only have to buy BIT for their customers. Token economics: they have completed the private pre-sale and now they’re going with the whitelist pre-sale on April 9th until April 11th and the main sale will begin on April 12ththrough to May9th. The token supply is 2 billion BIT, with a soft cap of $3,000,000 and a hard cap of $15,000,000, having all unsold tokens burnt. The minimum amount of BIT tokens for purchase is 1000 and the price per token will be 0.00003472 ETH.